Brandon Roy retired from professional basketball last week, at the age of 27 and after just five seasons in the NBA. He has, he told the Portland Trail Blazers, "degenerative knees." You don't expect "degenerative knees" to take down a 27-year-old, and certainly not a 6-foot-6 27-year-old who spent his good days dropping in soft little jump shots from 18 feet. "Degenerative knees" are a big-man affliction. You hear "degenerative knees" and you think of Greg Oden, Roy's Blazer teammate for four seasons. Somehow, though, Roy's knees aged in dog years, too. He had three knee surgeries in 18 months, and he doesn't have enough cartilage left to lean on. That's a shame. With Roy out of the game now, we lose a unique skillset that was as quiet as it was effective. We lose, in particular, that great step-back jumper. Just eight months ago, we were watching Roy play as if his knees didn't matter. When he took over Game 4 of the Blazers' first-round playoff series against Dallas, there was reason to think that maybe the knee surgeries had worked. We'd seen Roy perform similar heroics before—after one bucket against Dallas last spring, TNT's Kevin McHale yelled, "Another flashback move from Roy! "—so there was no reason to believe it was a fluke. 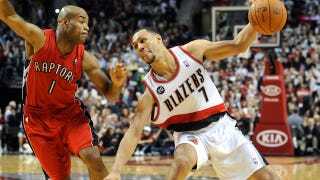 He scored 18 points in the fourth quarter alone and the Blazers overcame a 23-point deficit to win, 84-82. Roy proved that he could still slash through the Mavs' defense; he could still drive and finish to his left and his right; he could still jump from the point to the two-guard without anyone really noticing it—and he could still make that step-back jump-shot. This was one of my favorite things about Roy's game—and it's one that definitely required good knees. Roy could slash through a defense nearly as well as Dwyane Wade in his early years, and he could find the open man on the perimeter when necessary, but some of his best moments in the NBA came off of his step-back jumpers. It helped that, like Dirk Nowitzki, Roy was capable of creating an embarrassment of space for himself whenever he wanted. But he went about doing that differently from Dirk. Where Nowitzki uses his body (especially that right foot), his size, and his fadeaway to get a shot off, Roy earned his clean releases on the attack, with a big, sweeping dribble that he always pulled back at the last second. Then he threaded the ball between his legs and squared up to shoot—and he was always squared up, even when he had no right to be—as his defender stumbled into the lane. His step-backs hardly ever even required a fadeaway because he sold the first few steps of the drive so convincingly. The best basketball moves take on something like a personality. Hardaway's crossover was a happy little trick. Jordan's turnaround was imperious and taunting. Roy's step-back combined a little of both. When a player moves that well, you rarely consider that worn-down knees might take him out of the game. The 27-year-old juker-and-shooter isn't the caricature of a pro with a debilitating injury. If there is one, it's Roy's teammate, Oden. With men like Oden, we're accustomed to seeing them in the injury reports, seeing their hulking figures in oversized suits on the bench, clapping and generally looking uncomfortable. Arthroscopic surgery being what it is now, basketball's casualties don't arrive as suddenly as football's or hockey's, but bad backs and knees are considered part of the burden of being 7 feet tall. You expect Oden to duck early (if not this early). You expect a guy like Roy to hang around for years. And that's what's been funny about Roy and the Blazers these past few years. For the most part, they've depended on young players who have exceeded our expectations and taken them to the playoffs for the past three straight seasons. They even ditched the old "Jail Blazers" reputation along the way. (Head coach Nate McMillan certainly has had a lot to do with that transformation, as well.) And even as it's happened, the story of the team has been Roy's knees and Oden's everything. No young, up-and-coming team has ever felt so old and decrepit. When Roy took a step-back jump shot, though, or when he played fourth quarters as if he were still trying to make the team, we were reminded that he was still very young and still very good. It's a pity that his knees acted as if they were neither.